During the worst parts of the year, the weather can throw storms at us that we are sometimes not entirely prepared for. When this happens, it is of the utmost importance to protect what you have, and one of the best ways is to invest in well-built cyclonic sheds to guard your living and working spaces and valuables. Be it an office or in a domestic area, the weather is not picky about what it can damage. And when these terrible storms do occur, most everything is at risk. This includes your office, your home, your warehouses, and virtually anything else. As such, having the right kind of building is necessary as a type of insurance in case the worst should happen. You never know when tropical storms will arise, but it’s always good to be ready for the possibility. Luckily, we have a number of different options for sheds to shield you from even the worst kind of weather. Our most interesting is the combined unit of storage sheds, warehouses, and offices. This super centre is specifically designed to handle even the worst cyclones. Featuring an extra cladding, this is truly the shed of the future and has even the appearance of a high quality office. In WA, mining is an important industry, but even those facilities can be in danger when troubling weather strikes. To counteract this, we have mining buildings that are structured in such a way as to protect them from the extreme elements. There are a number of options available for this type, including internal walls, high bays, and outside awnings. On the home-front, away from the office and mines and into the domestic setting, a family’s valuables and stored items need to be safe during tropical storms. To ensure this, we offer garages that are built to the highest national standard for high wind safety and are definitely built to endure the sometimes intense weather of the region. All of our cyclonic sheds are also completely customisable in terms of dimensions and some with warranties. Upgrades to our methods are being made constantly to make sure that even the strongest cyclones can’t harm your belongings. 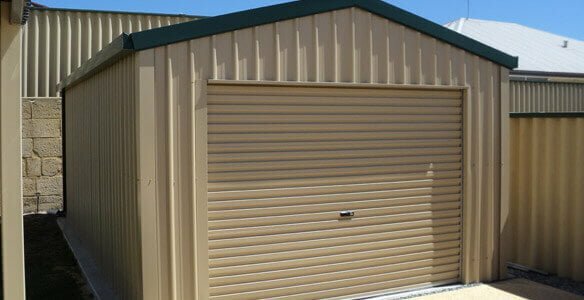 If you have any questions about our cyclonic sheds, call us today at 1300 778 628.